I was really excited to read this review copy from Harper Perennial. I remember enjoying Justin Taylor's short story collection Everything Here is the Best Thing Ever - of reading his stories and experiencing these moments that were more like memories, of being pulled back into my younger-self, surprising me with their familiarity. So I was not entirely unprepared for those same feelings and memories to be yanked back up towards the surface while reading The Gospel of Anarchy. Justin managed to create a world populated with characters that closely resembled people I had known once-upon-a-time, living a life that was eerily similar to the one they were living. The novel follows David - a college dropout working a dead end job - as he escapes the choking confines of his humdrum life after running into a former high school friend in the back alleys of Gainesville, Florida. What began as a little bit of fun and foolishness became a new way of life for David. His old friend Thomas and the residents of Fishgut - a broken down house that serves as half home, half hostel - live a life of lawlessness. They scrounge their food out of dumpsters and contribute money to the "house funds" by stealing products from one store to return them for full price at another or by donating their blood. They are punks, they are anarchists, and they have created a following with their handmade booklet called the "Good Zine" and by preaching the word of "Parker" - one of the original founders of their punk anarchist movement who mysteriously went missing one night. They sneak into underground concerts, participate in threesomes and group orgies, and seem to have a never ending supply of alcohol and drugs. Those memories I talked about earlier? Well, The Gospel of Anarchy reminded me of a group of friends I had back in 1994. At the time, I had an uncanny ability to become friends with just about anyone. At one point, I suddenly found myself hanging out in a Florida trailer park with a handful of teenage skinheads and hippies. The trailers were beat up and barely livable, some without electric. Most of the kids had dropped out of school, or were recently graduated with no real life ambition. They seemed to have no income to speak of, and I wasn't really ever sure who actually lived there and who was just hanging out or simply passing through. Lots of drugs were had (though, miraculously I managed to escape that period of my life 100% drug free), lots of things were stolen from god knows where, and lots of rules were broken and rewritten without rhyme or reason. When we left the trailer park, we hung out in groups, kicking back in the grass under the hot summer sun, the hippies playing folk songs on their guitars with the grass between their toes believing they were talking to God while the skinheads hated everything that moved and swore to buck the system and live a carefree, workfree life taking advantage of "the man". We baked birthday cakes of chocolate and vanilla with sprinkle rainbows and rainbow colored swastikas and enough candles to burn the trailer down. They shaved and dreaded each others hair, preached to one another about spirituality and the evils of politics. They were the coolest bunch of kids I had known, and they included me in their crazy, unlikely clan. After a few months, though, the scrounging and lounging wore on us - even though most of us had homes of our own and families that we returned to every night. Little by little, the fighting took over and we slowly broke off into splinter groups, which became sad little threesomes, and then singled ourselves apart until the trailer park and the rainbow cakes became our "remember when's". 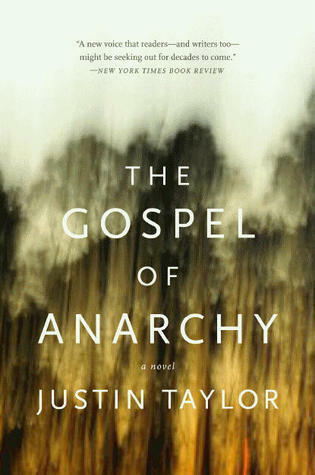 Justin Taylor's novel brought all those moments back to me in a way that my old photo album never could. And for that, I want to say thank you. The book sounds great, Lori! But I loved hearing about your teenage days! I wish I was as cool as you and the people you hung out with... sounds like you had a blast!! That was a very interesting time in my life. They were some of the best friends I've had. Though the friendships were short, they were fierce. And we felt separate from the world, untouchable... it was a cool experience, but certainly one I would not want to replicate at this age! I'm not familiar with this author or his books but I loved this review. Why? Because reading about your personal experiences and those friendships was so poignant and real. It gave me a sense of what this book is about. Monica, thank you for your comment. I enjoyed sharing the story.. which is something I admit I do not do much of on this blog! These Are The Days That Dreams Are Made Of!